Reader responses to Friday's post emphatically confirm that I am not the only one that does not ‘get’ Paulo Coelho. Which is reassuring, but we should not be complacent, because intellectual superficiality can be found much closer to home in classical music’s love affair with the über cool TED movement. TED stands for 'Technology Electronics & Design' and is the brand of the privately owned not-for-profit Sapling Foundation whose main activities are networking conferences dedicated to "ideas worth spreading". The TED movement originated in Silicon Valley, California and its events are now held around the world, with the global spread helped by the TEDx outreach programme. Central to the TED format is a strictly enforced 18 minute duration for presentations, and there is a queue to join Bill Clinton, Lance Armstrong, Al Gore, Richard Dawkins, Bill Gates, Larry Page and Sergey Brin who have spoken at the conferences over the years. Classical musicians are also in the queue: a recent WQXR article identified a top five of TED classical talks by classical musicians from Benjamin Zander, Michael Tilson Thomas, José Antonio Abreu, Itay Talgam and Maya Beiser, while Deutsche Grammophon's hot young composer of 'Pocket Symphonies' Sven Helbig lists a TED appearance among his credentials. If you overload your book with a lot of research, you are going to be very boring to yourself and to your reader. Books are not there to show how intelligent you are. Books are there to show your soul. That fashionable and dangerous preoccupation with not boring your audience is also permeating classical music, as I was reminded by the performance of Mark Simpson’s new work A mirror-fragment… at the Barbican recently. A mirror-fragment… is definitely not superficial, but its eleven minutes duration is evidence of a trend towards shorter new music commissions. For example, the eleven compositions commissioned for the 2013 BBC Proms - see note below - have an average duration of just over twenty minutes, despite that average being raised by three substantial forty minute plus works from the refreshingly diverse trio of Thomas Adès, Nishat Khan and Narish Sohal. It is commendable that the BBC is commissioning so much new music, but just under half the new works run for a TED-friendly ten minutes or less, with the shortest coming in at four minutes. Just as policemen are getting younger, new music is getting shorter. Are today's composers trending towards 140 note works? Or are these short works evidence of tokenism in new music commissioning? * The BBC media centre press release for the 2013 Proms lists Tansy Davies and John Woolwich among the composers receiving commissions for the 2013 Proms. But these composers are not listed on the BBC 2013 Proms database which is my primary source, therefore any Proms commissions from them are omitted from my calculation of average duration. Clarification of whether these two composers are contributing new works would be welcome. Also on Facebook and Twitter. 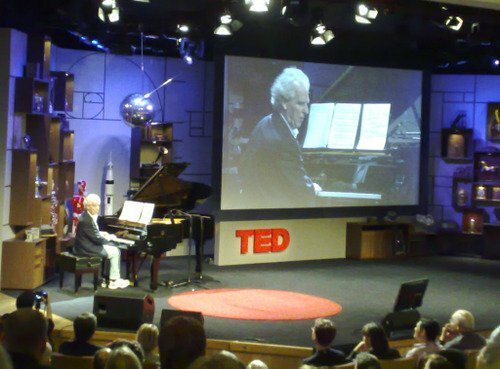 Header image of Benjamin Zander at TED is via Christopher Herot's blog. Any copyrighted material on these pages is included as "fair use", for the purpose of study, review or critical analysis only, and will be removed at the request of copyright owner(s). Well I can see two things about the 'short' commission that have nothing to do with audiences tolerance (or perceived lack of) for modern works. 1) a short commission costs less (lets not deny that, particularly in light of the continual arts budget cuts in most countries but particularly the UK and the US). 2) a short commission means the work actually stands a chance at being finished in time for the expected premiere, particularly if the premiere is part of a larger event with a fixed date (a-la the Proms). I might also suggest but I'm not in a position to confirm, that another issue with larger commissions is that of time and budgets - many arts funding organizations are on tight budgets these days and can't spare the money in one year for product that won't be delivered for 2 or 3 years down the line. On the other hand, the fact that composers are accepting these commissions for such short fanfares (like the BBC Music Magazine commission last year, Turnage's Canon Fever) shows either the bad (they take what they can get, as income is always hard to find) or good (they actually LIKE writing these works). I agree with this comment by Carl Zimmer. I gave up listening to TED talks a while ago; I was getting increasingly irritated at the tone he mentions, and I increasngly found that there wasn't enough actual information to hold my interest (echoing the "superficial" comment). And the "shortness in music" also applies to a couple of stations I used to listen to on (gasp!) FM and latterly over the Internet. I gave up on them because too much of their programming was single movements. And when someone is reduced to playing one movement from a Vivaldi concerto, it's time to move on. I wonder what the stats are for the average duration of pieces by living composers played by American orchestras. The impression among American composers, I think, is that the 10 minute concert opener is the most commonly commissioned and performed genre; with concertos, often for under-served instruments, coming in second. It seems tougher is to get a commission for a substantial symphonic work, although a few very prominent artists do receive such opportunities. I agree, Pliable, that if the curtain raiser genre dominates too much then something important is lost. I lost you after the first para, Pli.